More than 140 PhD scholars - Many with fellowships viz Prime Minister’s Fellowship, TCS, IBM, Intel, Cognizant & Visvesvaraya. Highly prolific faculty and Collaborations with leading international research groups. CSE - Computer Vision; Cyber security; Deep Learning, Pattern Recognition; Discrete and Computational Geometry, Approximation algorithms/Combinatorial Optimization/ Discrete Optimization and Complexity; HCI and Ubiquitous Computing; High Performance and High Productivity Parallel Programming; IoT Security; Machine Learning; Machine learning in Graphics and VR; Multimedia Computing, Social Media Analysis, Multimedia Information Retrieval; OS/Compilers; Personalized Speech Synthesis; Program Analysis / Program synthesis / Program Optimization / Code Search; Securing smart environments with self-adapting techniques; Social Media Analytics; Social Network Analysis, Data-driven Cyber security, NLP; Wireless Networks, Mobile Computing. ECE - Architectures for AI and ML applications; Computer Vision; Designing of High Capacity and Secured Elastic Optical Networks; Machine learning; Microwave (Antennas, Radar, RF Circuits); Nan electronics; Optical Networks; Personalized Speech Synthesis; Robotics / Control Systems; Optimization. HCD- Virtual Reality, IOT for smart living spaces, wearable for societal good, wearables for manned space mission, Interaction design Research. MSc in Mathematics with at least 70% marks in both B.Sc and M.Sc or 7.5 CGPA and strong inclination towards CSE/ECE. The Institute will invite a limited number of candidates for a written test and interview based on the academic records, statement of purpose, etc. Candidates who do not qualify in the written test need not appear for interview. The reserved category candidates will be given due relaxation in cutoff marks as per the norms. The online applications portal is available from 20th February 2019 till 14th March 2019. Candidates can apply only through the online application portal. There is no provision for offline submission of application forms. 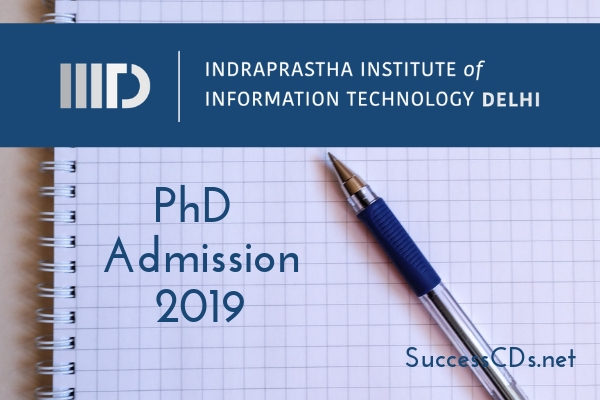 There is no application fee for PhD program.